So many Christmas Rice Krispie Treats, so little time before the big day (at least in my view, wherein the Christmas season should start in July). Here are a bunch of the classic treats all dressed up for the holidays. These Christmas Rice Krispie Treats above (with video how-tos) bring the number up to 28, but I made them after this post. And changing graphics is time-consuming, so apologies for that. 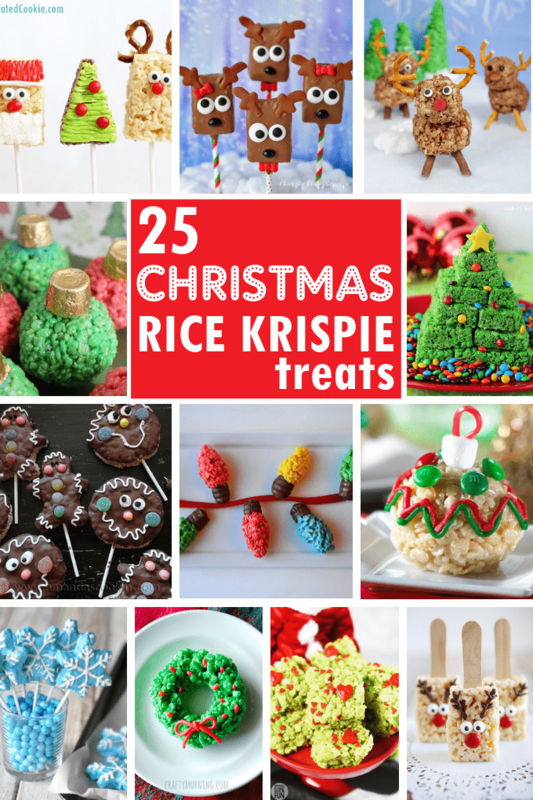 I love these Christmas tree Rice Krispie treats on my blog from guest poster Glorious Treats. Make reindeer Rice Krispie Treats at Land O’ Lakes. Make Santa’s coat Rice Krispie Treats at Kraft. 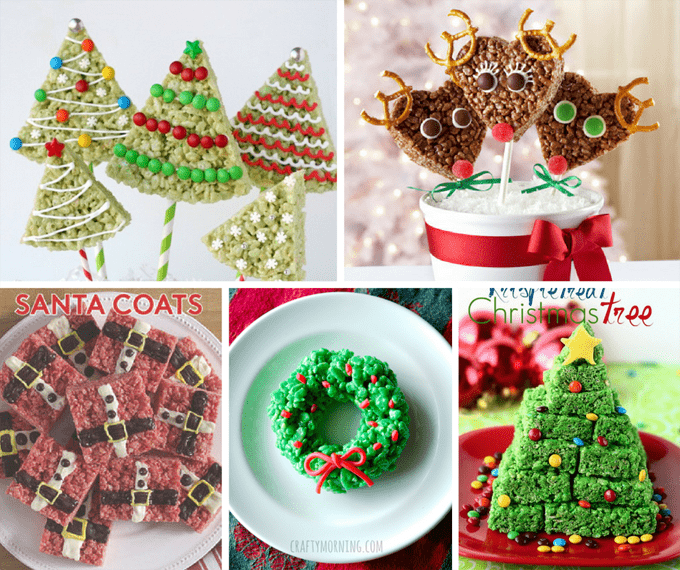 Make Christmas wreath Rice Krispie Treats (and more) at Crafty Morning. Stack them to make Christmas tree Rice Krispie Treats, at Cookies and Cups. 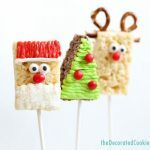 (One of my all-time favorites), make reindeer cocoa Krispie treats at Cute as a Fox. Yum. Make peppermint Rice Krispie Treats at Crunchy Creamy Sweet. Make Rice Krispie treat gingerbread men at Amanda’s Cookin’. Make Christmas lights Rice Krispie Treats at Sweetology. 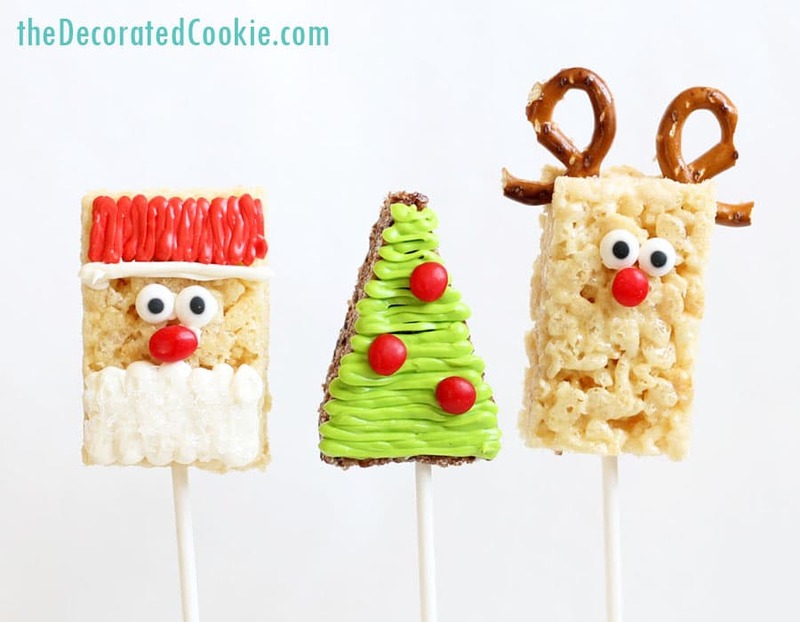 Make Rice Krispie Treat snowmen at From the Blue Shed. Make Rice Krispie Treat Christmas balls at A Spicy Perspective. Make this surprise Christmas Rice Krispie Treat cake at Food Network. Make Santa Rice Krispie Treats at Pink Polka Dot Creations. 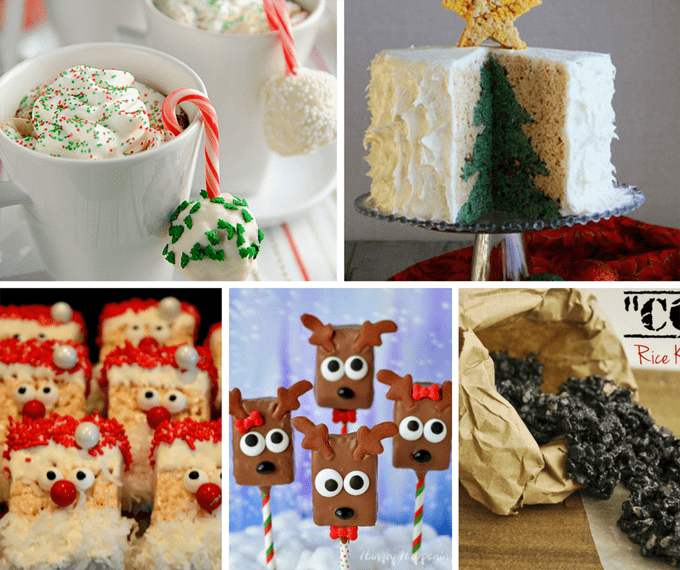 Make chocolate Reindeer Rice Krispie Treats at Hungry Happenings. For the naughty list, make coal Rice Krispie Treats at Mallow and Co.
Make hot chocolate Rice Krispie treats at Crazy for Crust. 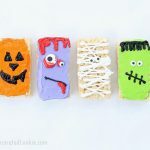 Make Rice Krispie Treat cottages at Land O’ Lakes. 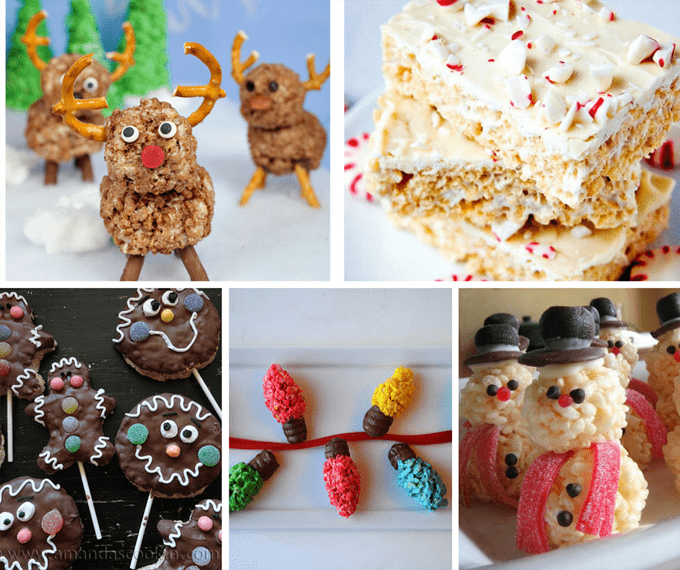 Make reindeer Rice Krispie Treats at Thirty Handmade Days. 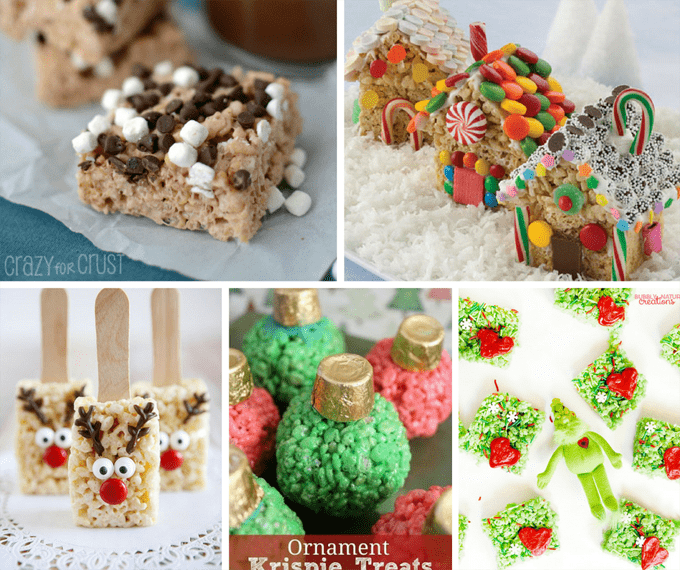 Make ornament Rice Krispie Treats at The Coupon Challenge. 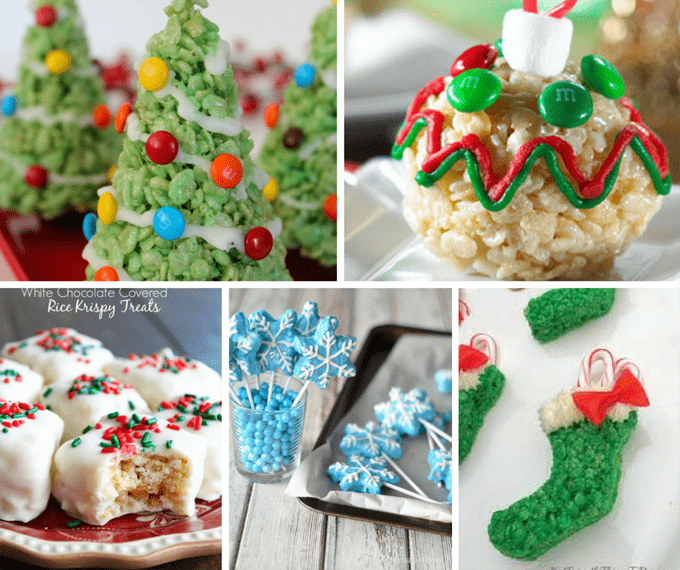 Make Grinch Rice Krispie Treats at Sprinkle Some Fun. 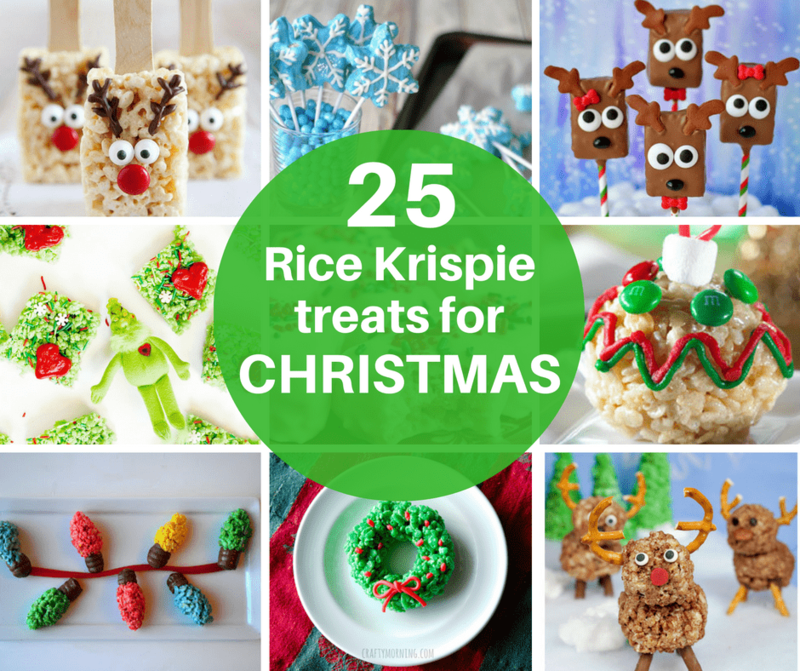 Make Christmas tree Rice Krispie Treats at Raining Hot Coupons. Make ornament Rice Krispie Treats at Canadian Family. Make white chocolate covered Rice Krispie Treats at High Heels and Grills. Make snowflake Rice Krispie Treats at Life is a Party. Make stocking treats at Kid Friendly Things to Do.